We're back! We were away camping for 11 days this time. Here is a shot of my sister and brother as they sail back into the cove of Shadow Bay Campground - one of 3 at Waldo Lake which is owned by the USFS. The atmosphere was not as clear as usual as there is a huge forest fire burning in Southern Oregon, so far burning over 73 square miles! Our youngest son Travis' wife Kristi surprised us by arriving 4 days early with all 4 of our grandsons! Here they are enjoying themselves in the cove - we'd brought the 2 jet floats for the little guys - the bigger boys were able to use our kayak. Michael, Gabriel, Hayden & Caleb with the little island in the mouth of the bay. The boys loved their little jet floats! We also had brought a little raft which Caleb shared with Jack, who they've played with for 3 summers now. We launched our Sunfish sailboats and this is my boat heading to "Amy's Blue Lagoon" - which is a secret hidden lagoon behind an island on the East end of the lake. My older sister Roberta named it after my daughter who was canoeing with her when they found this special place - our favorite on the lake for swimming and hanging out. My pretty sail. This sail was custom made to promote the 1988 movie "Tequila Sunrise" starring Mel Gibson, Michelle Pfeiffer and Kurt Russell - it was at a video conference in Las Vegas and a local video distributor won it and put it in the classified ads here and I got it for a 1/4 of it's value! :-) Love this boat! Can you see the island in the center of the photo? There is an entrance on the left and right to our pretty and wind-protected cove. Here is the lagoon and can you see my brother swimming with his hat on? The water here is crystal clear, has a visibility depth of 115 feet and is the 2nd largest lake in Oregon, with Crater Lake being the biggest. Dayle took the two littlest guys out for a short spin to show them what sailing was like, this is Hayden. "Glamping" - we cut the big stem of Stargazer lilies and they bloomed the entire 11 days! They brought huge amounts of visual and aromatic joy the whole week. Kristi found a darling tiny frog in the bayside rocks. Caleb, Michael and Hayden enjoying the lake, Hayden has a tiny frog in his hands. Kristi borrowed my camera to snap a photo of this fireweed flower right before sunset, the golden alpenglow on the trees. The boys posing for grandma on "the point" where we hike to see the sunsets almost every evening. This is my favorite of all the photos I snapped. The 3 youngest had tons of fun on this old rotting log. Chef Dayle made breakfast of grilled ham, sausage, hash browns with onion, sausage gravy and our home grown eggs. Does anything taste better than dining outside at camp? The flowers kept blooming up the stem as the week went by. Grandpa holding Buddy in one arm and Caleb in the other while Kristi looks on. The view of the lake from our campsite, it's that close. Our annual group shot - my younger sister Denise visited for 2 days, staying in a nice hotel in Oakridge 32 miles away, for 2 nights. Clean bed, wi-fi, shower, tv.. hmmm.. what are we doing wrong? :-) So, all four siblings, and just a few of our kids and grandkids. I love this shot - Travis and Kristi were playing Pente - a family favorite board game - and guess who won? Michael and Hayden smiling for grandma. My son Travis and his 1966 Mustang Fastback GT which he got when he was 15, he re-built the engine, transmission, rear-end, suspension, steering and re-did the upholstery and carpet, interior panels.. all by himself. Kristi is in her 1978 Westfalia VW Bus which Travis rebuilt the engine, fuel injection system, etc. They are ready to head home. I worked on Caleb's "Shocking Pink" Teddy Bear during daylight hours when I could see. I got one arm on it and have half the 2nd arm done. Below is my sourdough starter which I "babied" all week. I made a double batch of them for us for breakfast - I lamented that I forgot to take photos of the stack of pancakes with butter and syrup on them. But trust me, they were AWESOME!! One afternoon I was hiking down to the "point" and spied these tiny little flowers - I didn't have the camera that time, but later I found them again, just barely as the flowers are only as big as your thumb nail and I almost passed them by. I snapped a photo of them from the top.. the plant is only 10 inches tall! Here is the flower from the side and the buds. It was a good Huckleberry year - here is one of them. They are great in pancakes! Dayle found a lime green little frog.. cute, huh? Here is my boat on the side of the beach on our 2nd to the last day.. all stowed. On our last night, we invited my sister Roberta for dinner. I prepared the baked potatoes for the oven - scrubbed, buttered, salted and wrapped in foil. Dayle barbecued the beef tenderloins. I also prepared the asparagus. I set the table in the trailer with real plates and flatware and red bandanas as napkins. It was delish! After we had stowed everything in the trailer and on my boat trailer - we went over to say farewell to my brother's family - this is the youngest member of the family. Look at that face! My brother's family, minus 1 son and his wife and daughter and minus 1 DIL who missed the photo. And so, the journey down the mountain, Diamond Peak in the distance. I zoomed in on the peak - isn't it neat? Our camping dishes are our old Corelle set - can't stand paper plates either. Looks like you escaped all the wildfire smoke and had a wonderful 'glamping' trip. This seems like such a perfect trip! I would love go myself! I also have to say that I LOVE that VW bus!!!! Awsome post Teresa and welcome back. Such a good family fun time had by you all. Thanks for sharing your time at Waldo Lake with us, Teresa...so many fantastic photos and a great narrative! I have consulted a field guide book about flowers and looked on the Internet but haven't found your stunning little flower, yet. I'm glad that you and yours had a good trip! Have missed you, but good to see you had a wonderful vacation with family, doing what you love at a place where you thoroughly enjoy yourselves. Clear water, lovely sites, fresh air, who could ask for more. Now comes the fun part, returning home and resting up. Thanks for sharing. Always enjoy your pretty photos. Your photos are great! Looks like a wonderful trip! And, a wonderful family! That Pippsissewa flower is fascinating. I've never seen one like it. I love your colorful crochet throw. It's so pretty! We have a Comfort trailer too! They sure are made well. Thanks for sharing your wonderful vacation photos. Hi Teresa,So nice to hear from you again and as always loved your post!!!WOW!! !Looks like the perfect holiday!! !Beautiful spot on the lake!! !Love all of it!!! !Have a happy and creative week!!! I actually almost feel as if I've had a holiday myself reading your post. How lovely that you all get together like this and have fun. Thank you for sharing the beautiful photographs with us. I know nothing about flowers other than that one is very pretty! What wonderful photos Teresa! 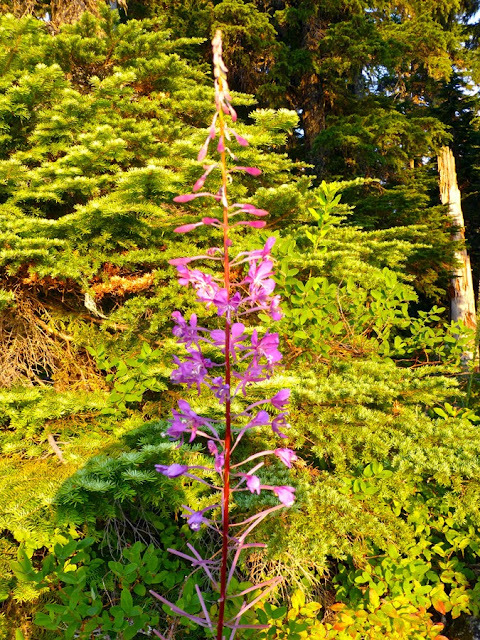 I especially loved the unusual wildflower (so unique and gorgeous), the lake (needs to be renamed 'Paradise on Earth Lake'...LOL), that sunset (simply amazing), your table setting in the trailer (I prefer real plates too) and--of course--those cute grandkiddos and family of yours! Teresa, I love each and every photo, you are so blessed with a family that loves being together. The boys look like they had a fabulous time, I am glad you had time with your siblings and their families too. It looks like a splendid vacation, but I have to say you were missed so I am so glad you are back. Such wonderful photos of your happy family time at the lake. I so enjoyed seeing the pictures and reading all about it too. It certainly is a beautiful place! The little flower you found is exquisite.....so glad you finally found out the name of it. Wishing you a happy week at home, Teresa. Ok, let me try this again! I was here right after you posted this, and couldn't comment. Then yesterday, my Mom came out, and we were out and about all day long! I just reread it, and it was just as delightful the second time around! What a gorgeous lake! What a beautiful sailboat!!! 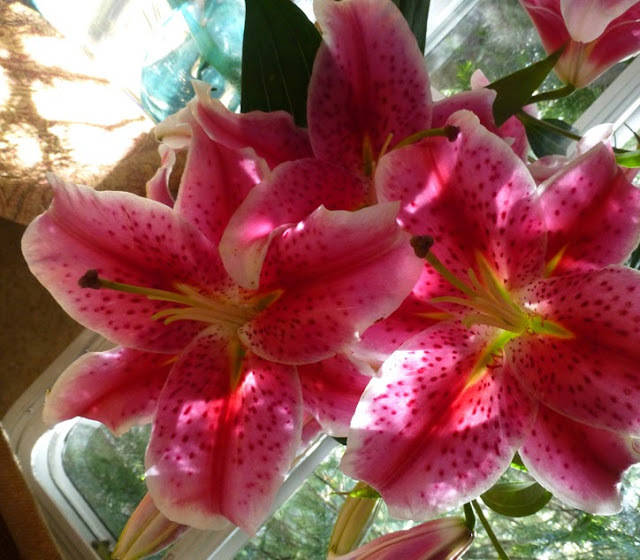 I love those stargazers.....so gorgeous! And food...oh my! Love me some gravy! The kids looked like they were having a ball! Is the lake cold? So great that you and your siblings get together like this!!! Your son and his wife are ever so helpful and generous with their time to you and Dayle. So nice to have such help! I can see why you love this place Teresa!! Loved this post!!! I LOVE THIS POST! Looks like you all had a fabulous time. What a nice surprise for Kirsti to show up a few days early. I know that made you smile. It's amazing that you love to sail(something I wish to learn. Absolutey the most beautiful scenery I've ever seen, no wonder you love it there! Had to laugh (a lot) about the frog possibly jumping on you( I laughed out loud) your a brave woman getting so close to it! Love all the family shots and the youngest little addition to your family is soooo cute I could just squeeze him! So happy you had a wonderful trip and glad you made it home safe. You were surely missed! P.S Your little pink bear is looking great! It looks like you had a fabby time with your family. Just awesome! The lake is lovely :) Thanks for sharing...I enjoyed reading all about your vacation. Hi, Teresa! Finally I got to your posts! I came back from Kazakhstan last week and just peeked in your blog... And oh my.. what a beautiful trip you had! You have such a big family and this is great that you find time to get together :) i LOVED the sunset pics... mesmerizing nature! I will start following your posts regularly now as I missed so many of them!